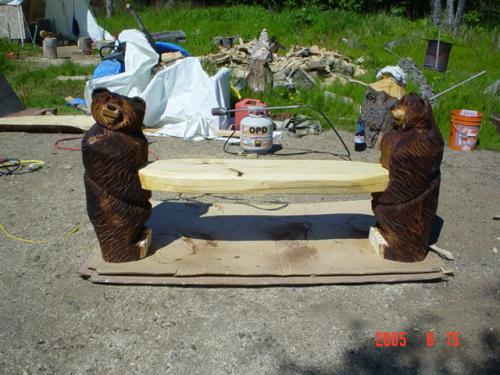 Eric used a new chainsaw carving design for this three bear bench. 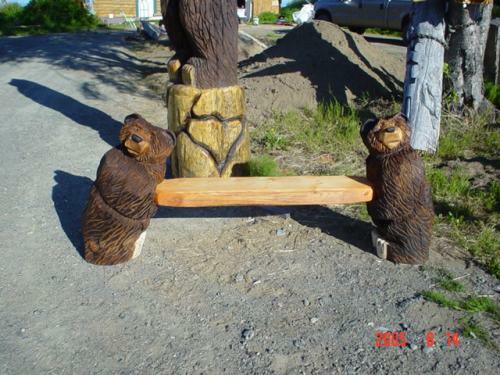 He created the two bears in a log as the base legs for the bench, but the entire bench, back, and top bear are all carved out of one log. The grain of this beautiful cedar is breathtaking to see in person. 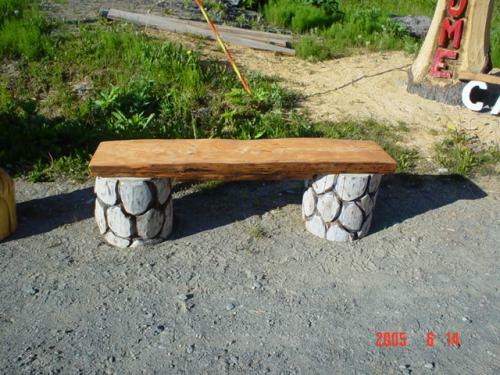 Eric carved the rock bench out of Western Red cedar. He used a gray stain on the rocks and a redwood stain for the plank of the bench. This simple bench looks great anywhere people want to enjoy the serenity of nature. Eric recently began employing pyrographic touches to some of his chainsaw carved sculptures. This particular piece is a close-up of the back to a bench he created for a client. The grain of the beautiful western red cedar is a fabulous backdrop for an Alaskan mountain scene. 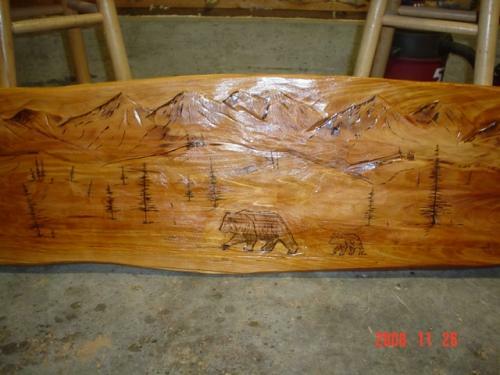 Here is the full view of the mountain scene that Eric burned into the back of the bench. If you look closely, you can see a bear and a moose. 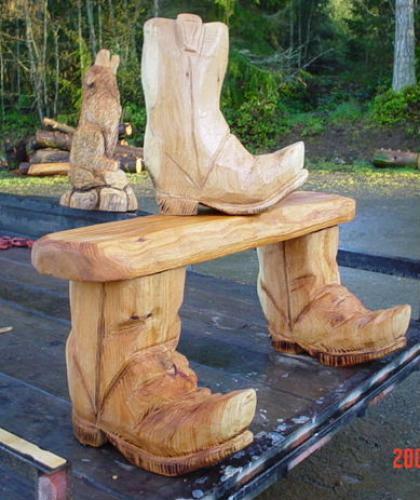 The boot bench carving was inspired by a 4-H group in Washington. These were three of the first boots Eric ever carved and the client was very pleased. The Mini Bear Bench flows in lovely western red cedar-grained curves. 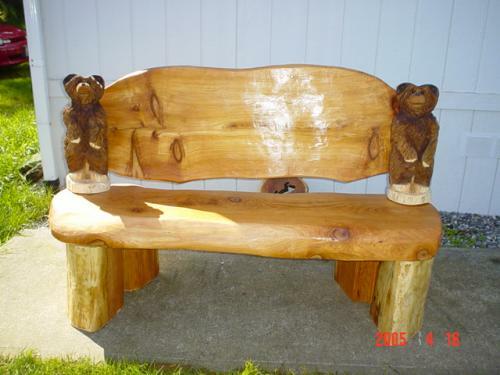 The two bears have a brown stain on them, but the bench itself only has marine spar varnish on it so as to truly allow the grain to shine. 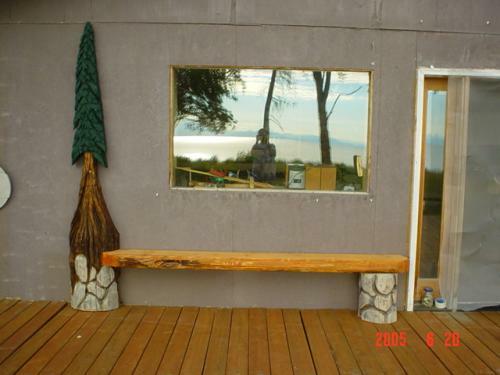 This one-of-a-kind bench was a custom order and when it was delivered looked fantastic on the client's deck facing the Straits of Juan de Fuca. 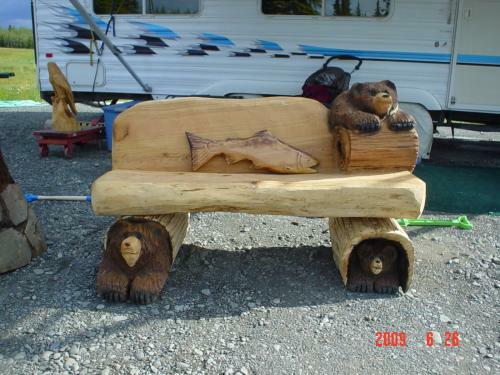 This bear bench was carved out of Alaskan spruce and sits two people. The Fox and Owl bench was truly a joy to watch take shape. Eric used a thematic approach to this chainsaw carving which captures the mother great horned owl protecting her young owlets as the fox attempts to decide if the rock climb is worth his effort. This functional piece of art will seat four or five adults. 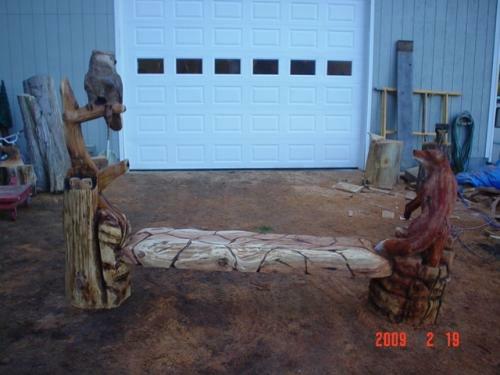 Another view of the Owl and Fox bench. 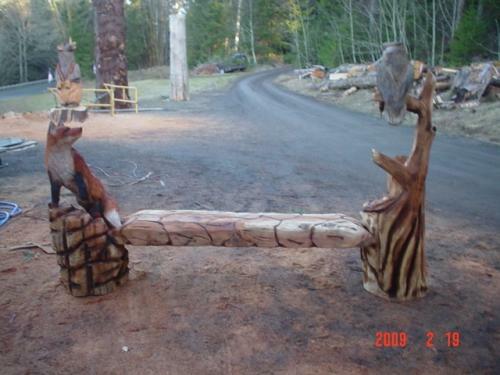 The Gauntlet is a fabulous chainsaw carved sculpture that is carved out of three large logs. 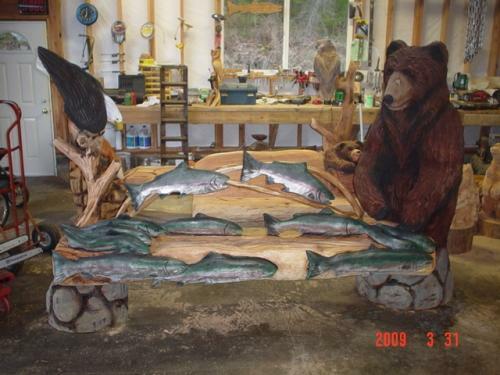 All the fish in the bench portion are carved into the log. This piece is truly a fantastic piece of functional art. 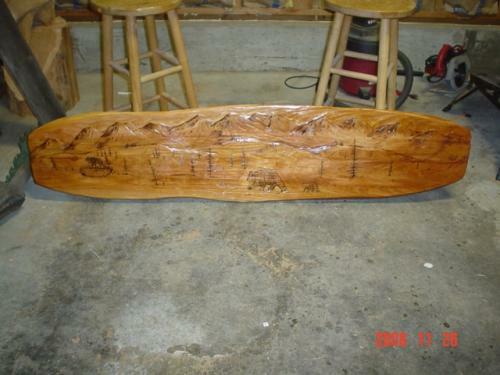 Eric was asked to create a bench for a client's back deck which faces the Cook Inlet in Alaska. Here, he carved a simple tree and rock bench for the clients' to use to enjoy their fabulous sunsets. 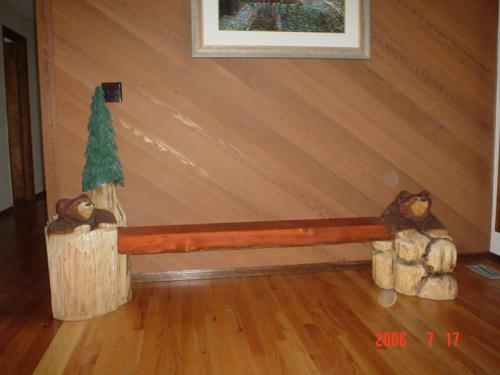 Here is a fun bench that Eric created with two bears and a tree. The seat has a redwood stain on it which really made the stylized art piece pop. When the chainsaw carved sculpture was delivered, the clients were thrilled at the effect the piece had on their foyer. One of our newest functional art pieces, this simple bench has been very popular. 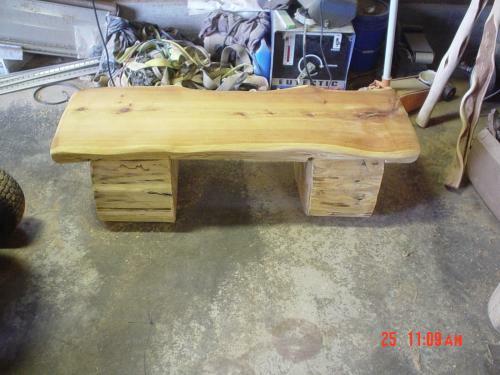 It's a nice cedar bench with lots of character just in the gorgeous grain.